Surrounded by lush greenery and fronting one of Malaysia’s largest 7,000 acres fresh water lake, the resort is only a 3 hours drive from Kuala Lumpur and easily reached just off the Bukit Merah toll exit along the North-South Expressway. Being one of Malaysia’s premier eco-tourism destination in the northern region, the resort offers a wide variety of excitement with its Water park being the main attraction, the only conservational Orang Utan Island in Peninsular Malaysia and the unique Eco Park with its educational walk-in enclosures, where you can experience nature with eco-friendly animals. 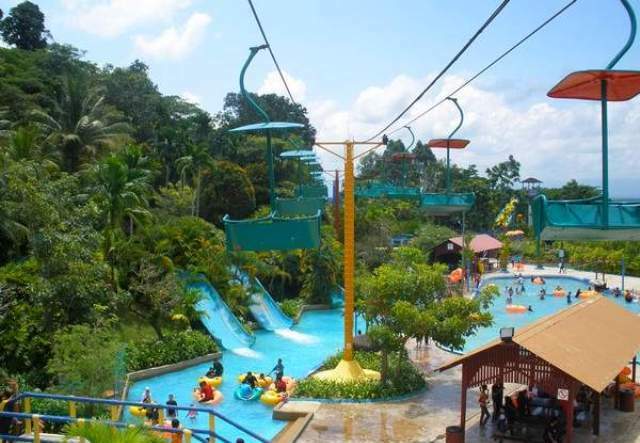 Bukit Merah Laketown Resort offers a variety of accommodation all at one location. From hotel rooms to serviced apartments, lovely resort homes and luxury ‘Kampung’ chalets by the lake. For the more adventurous, you can even try out a camping holiday at the lakeside camping ground. The Ecopark is a complete research, breeding, education and tourism facility that promotes a “Say hello to Nature” concept where visitors are encouraged to ineract with the animals in their natural habitat. Come and see the intelligent exotic animals respond to their keeper’s commands. Hand pedal our colorful Skycycle and take a unique 200m mid-air tour across the tropical rainforest. Take in the breathtaking view and a take closer look inside the Pet’s Park corner. Experience macaws, cockatoos, spoonbills, swans, bulbuls and stralings feeding from the palm of your hands, in lush green surroundings. 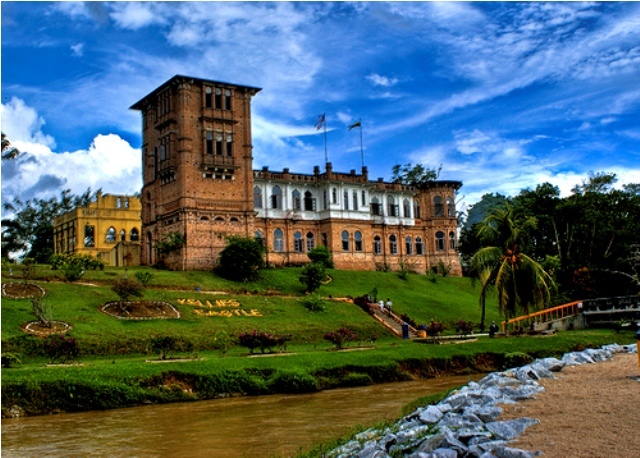 Kellie’s Castle was meant to be a home away from home for Scottish Planter, William Kellie Smith in the 20th Century in Perak. Being far away from his home country, Kellie desired his new residence to be reminiscent back in Scotland. The castle is perched on top of a hill in what used to be a rubber estate. William Kellie Smith was an interesting man who was popular with his South Indian workers. Kind at heart, he erected a Hindu shrine for his workers on the castle premise. As a token of appreciation, his workers in return erected a statue of Kellie complete in a white suit and hat. Construction of this unique castle in 1915. However, work came to an abrupt half with Kellie’s sudden death in 1926. The solitary castle, looks almost surreal in these wild plantations of Perak, it projects a strong personality and an aura of mystery. Recently, efforts have been made by the Perak State Government to rescue this magnificent structure from falling into ruins. Besides being claimed to be haunted, the castle is believed to have hidden rooms and secret underground tunnels. The road that leads to Kellie's Castle follows the contours of the land in a dizzying, maze-like fashion, adding to the mystery and romance of the place. Hidden amongst the lush greenery of Tambun, Ipoh is this latest jewel in the Sunway crown. A fully themed water park that appears to emerge from surrounding limestone cliffs and vibrant jungle- new world of adventure just waiting to be explored. What was once a valley, of old has now exploded to life with the river of adventure, raging waterfalls, rushing rapids, majestic cliffs, magnificent tigers, ancient caves and hot springs with ancient therapeutic properties. Perfectly landscaped, the beach is surrounded by 20 feet twin waterfall with two rivers flowing to the pool, white crystal sandy beach, lush tropical gardens, majestic rock formations, enchanting musical shower and water fountains. 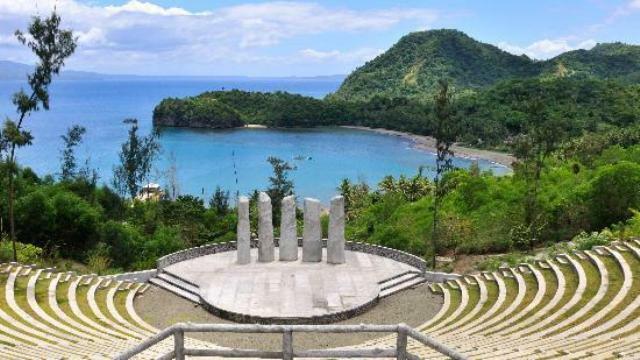 These unique features compliment the magnificent ambiance of the natural limestone hills. Not in the mood to get wet? Giddy Galleon is a perfect family ride that will deliver a brand new experience to fun seekers. Pulau Pangkor (Pangkor Island), the most popular holiday destination in Perak, welcomes visitors with its serene golden beaches, crystalline blue waters and cool refreshing breeze. Located off the shores of Lumut town, about 90km southwest of Ipoh, this island definitely makes an ideal gateway. The people of Pangkor are mostly fisherman (who catch mainly cuttlefish and anchovy) and local traders who live in a chain of villages that thread along the eastern shores facing the mainland. 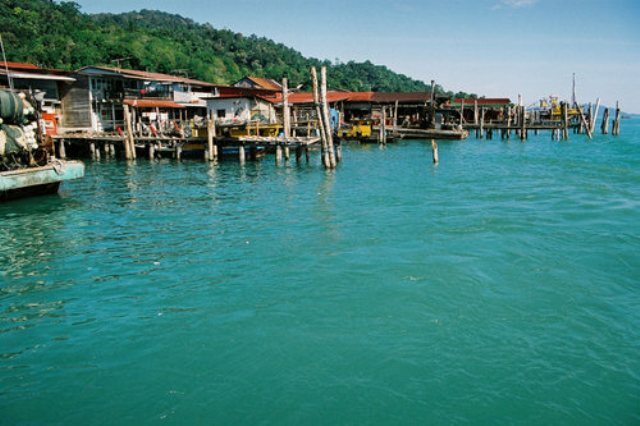 The fishermen live in scattered settlements on the eastern side, facing the town of Lumut and Teluk Batik. Visitors get a chance to see some of them on the 40-minute ferry ride from Lumut as the ferry stops at the main settlements of Sungai Pinang Kecil and Sungai Pinang Besar before landing at Pangkor Town. Visitor have a rare chance to live near fishermen and observe their lifestyle and also to simply enjoy the fine beaches and resort amenities. Pangkor's two popular beach areas of Pasir Bogak and Teluk Nipah offer sun and sea enthusiasts activities like scuba-diving, snorkelling, wind-surfing and fishing. While Pasir Bogak is quite developed, Teluk Nipah still retains its kampung or village atmosphere. Teluk Ketapang or Turtle Bay still receives turtles on their egg-laying pilgrimages. Some of the resorts on the island also have excellent golf courses on their property. Towards the north and northwest of Lake Temenggor lies a vast area of virgin jungle known as Belum State Park. 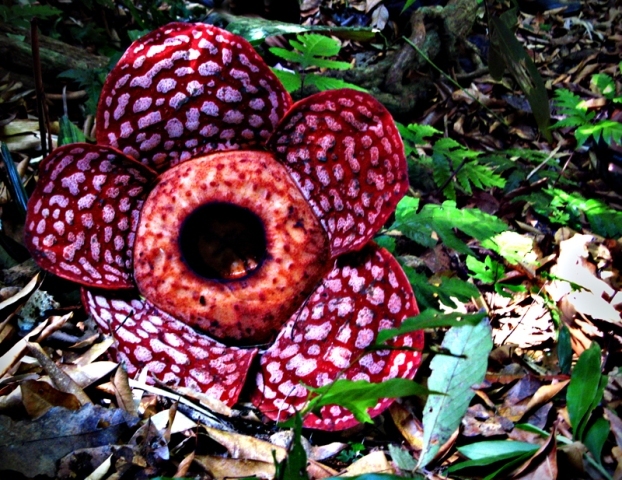 The area is one of the largest untouched forest reserves in Peninsula Malaysia. This pristine forest is excellent for trekking, bird watching and animal sightings.The presence of large mammal species such as elephants, rhinoceroses, tapirs and tigers makes Belum very special. This forest possesses an immense wealth of flora and fauna with much of the area still unexplored and undisturbed by humans. Various tour operators now offer guided tours to certain areas of the reserve and will arrange for the necessary permits, river and road transport and accommodation, which may include camping. 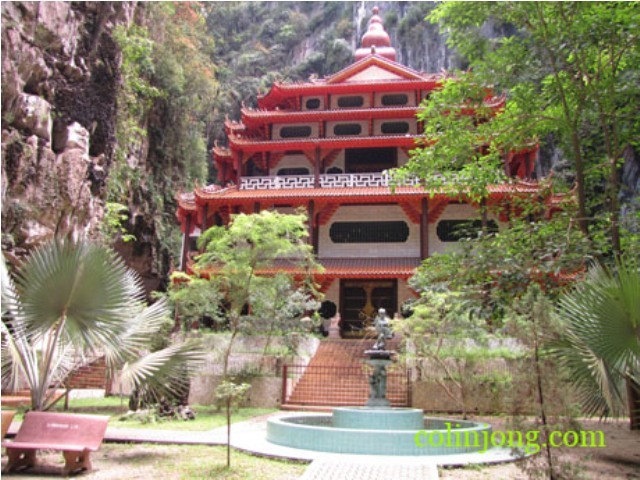 Sam Poh Tong is a famous cave temple located in Gunung Rapat, about 5km south of Ipoh. It is said to be biggest cave temple in the country, and is an impressive work of art with various statues of Buddha interspersed among the stalactites and stalagmites. According to legend, the cave was discovered in 1890 by a monk from China who was passing through Ipoh; he decided to make it his domicile and a place for meditation. He remained there for 20 years until his death. Till today, nuns and monks who dedicate their lives to Buddha still occupy the Sam Poh Tong. The present temple facade dates back to the 1950s and a stiff climb of 246 steps will lead you to an open cave with an excellent view of Ipoh and its surroundings. Other attractions at the temple include a beautiful Japanese pond full of Japanese carps and tortoises (symbols of longevity) located outside the cave and a vegetarian restaurant. Within the temple visitors could discover the artistic works of man and nature-beautifully craved statues of Buddha in various forms in a backdrop of unusual formations of stalacties and stalagmites. On a 6.5 hectare site, nested in the serene and lush forest patches, hills clear cold mountain streams and rivers, swaying oil palms and durian orchard lies a haven of tranquility. 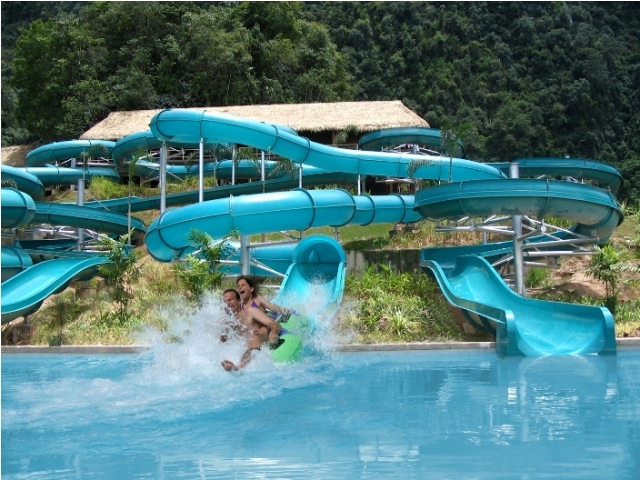 Its unique concept of a specially designed free flowing Hot Springs Swimming Pool and Therapeutic Park at the foothill of the Titiwangsa Range, 200 feet above sea level is indeed creatively engineered to attract visitors who appreciate the wonders of nature. Families visiting the park can try out the family baths and enjoy the privacy of this special treat. Another popular family activity not to miss out on is the hot springs egg-boiling experience. 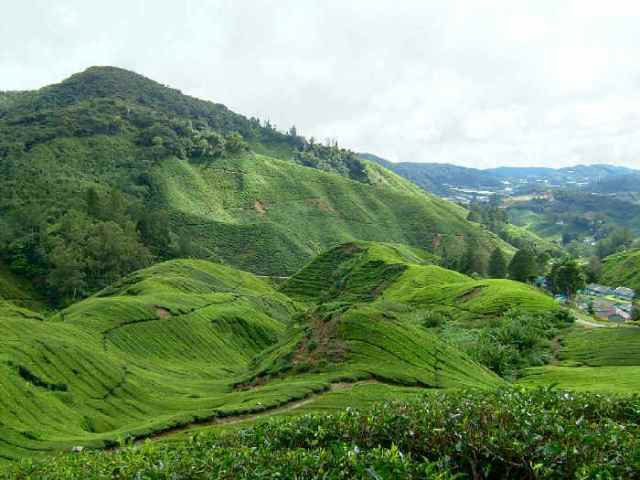 BOH Plantations Sdn Bhd is the leading tea grower in Malaysia with four tea gardens-Boh, Sungai Palas and Fairlie situated in Cameron Highlands; and Bukit Cheeding in Sleangor- constituting a total land area of 1200 hectares. With a production capacity approaching 3000kgs per hectare, the Company produces 4 million kgs of tea annually which translates to about 5.5 million cups per day. This represents about 70% of all tea produced in Malaysia. Sungai Palas Tea Estate, is another tea plantation owned by Boh and it is located further up north from the mail plantation. A definite must on the list of things to do in Cameron Highlands is a visit to the new Sunagei Palas Tea Centre. Recently opened by BOH Plantations at the Sungei Palas tea garden, it is above Brinchang, in the very heart of the Cameron Highlands tea country. Located on the hilltop, amidst rows of tea bushes and close to Gunung Brinchang, it offers the best possible introduction to Malaysia teas in a truly spectacular setting. Bharat Tea Estate located along the main road from Ringlet to Tanah Rata this is a good spot where you can stop and enjoy a scenic view of a tea plantation. There is ample parking here along the road and there is also a small tea shop where you can enjoy a cup. This is also a great spot for taking photos. 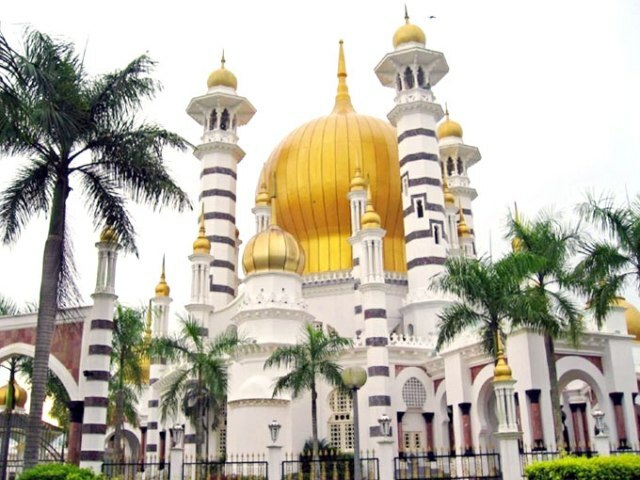 The stunningUbudiah Mosque with its golden domes and minarets has a well-deserved reputation as one of the most beautiful mosques in the country. It has graced many a magazine cover, and is a source of pride to the locals as well as a symbol of their faith. It is located at Bukit Chandan Recreational Park in the royal town of Kuala Kangsar. It was bulit during the reign of Sultan Idris Mursyidul Azam Shah I (1887-1916), the 28th Perak ruler. There were problems during its constr, which started in 1913. Once, two elephants belonging to Sultan Idris and raja Chulan ran over the expensive imported Italian marble tiles. The outbreak of the First World War caused a delay in replacing the marble, and the mosque was completed only in 1917, when it was officially opened by Sultan Abdul Jalil Karamtullah Shah. The burial site for Perak's royal family is also found near the mosque. From the North-South Expressway, take the exit at the Kuala Kangsar inter-change station. From Kuala Kangsar town, take Jalan Istana heading to Bukit Chandan.